Too busy to devote an entire week to kayak touring in Europe? Or do you simply crave a long weekend getaway filled with sunshine, outdoor activities, and great food? Take a Short Break! Like our Island Hopping Tour, AKT’s Short Break Tour offers the beauty of the Elafiti Archipelago region, geared for travelers who are on a tighter timeline. 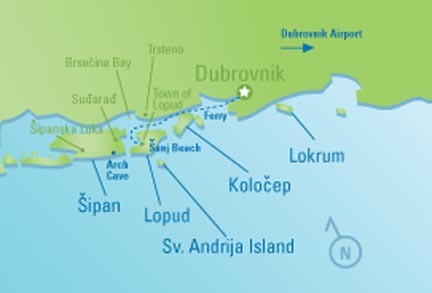 Short Break Tours are based on Lopud Island near Dubrovnik. Full Meal Plan*: 5500 Kn / €740 / US$845 / £655 Includes: 3 breakfasts/ 3 lunches/ dinner all 4 nights. Meal option does not have to be chosen in advance. Choose from one of two meal plans. Meal plans do not need to be chosen in advance. Too busy to devote an entire week to kayak touring? Short Break is a condensed version of our most popular Island Hopping Tour. * The early ferry departs Lopud at 6:20, arriving in Dubrovnik at 7:10. You may make a departure flight at 9 am or later. You may opt for a later ferry, 12:10 pm, if you don't have immediate onward travel plans.